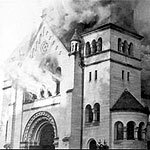 Todat, Nov/09/06 is the 68th remembrance day for the Kristallnacht (also known as Night of Broken Glass). From Wikipedia about this night:"This was a pogrom against Jews throughout Germany and parts of Austria on November 9–10, 1938. Jewish homes and stores were ransacked in a thousand German cities, towns and villages, as ordinary citizens and stormtroopers destroyed buildings with sledgehammers, leaving the streets covered in smashed windows — the origin of the name "Night of Broken Glass." Jews were beaten to death; 30,000 Jewish men were taken to concentration camps; and 1,668 synagogues ransacked or set on fire. The Times of London commented: "No foreign propangandist bent upon blackening Germany before the world could outdo the tale of burnings and beatings, of blackguardly assaults on defenceless and innocent people, which disgraced that country yesterday."